This book review is part of a collaboration with Zulily during their current National Geographic event. The books are gorgeous. The photos are big and make every single animal seem life-like. There is so much information packed inside these pages that we will use when my daughter inevitably asks, "Are lions really cats like the neighbor's cat?" or "Do crocodiles live in Africa or Australia?" Because already at 4, these are the questions coming out of her mouth. And now we have a place to look up the answers. She's also expressed interest in wanting to know the names of the insects we see, and AHA! we now have the perfect book to use to identify them. But I wasn't really sure what she would actually want to do with these huge reference books. The real magic happened when she saw them on the kitchen table when she woke up on Saturday morning. She wanted nothing to do with the TV or even trying to convince us to take her to the Disney Store (because after our trip to Disney World, she pretty much tries to get us to visit the Disney Store every week). Instead, she said, "Are these books for me? Can I look at them while I eat breakfast?" And in that moment, I remembered how I used to look through my parents' National Geographic reference books that they kept on a low shelf in the living room. For hours. I had forgotten about them and hadn't made the connection that Ellie might love the very same thing at her age. So we dove into the insect book. She wanted to name every single insect she knew and then had me name any that she didn't. Then she saw a wasp and said, "This one has pretty wings. What is it?" I explained knowing she would be surprised because after being stung by two wasps last fall, she's afraid of them and often asks if I see any or if there will be any where we are going etc. We were able to read about them and talk about how colorful they are and how one kind of paper wasp can even recognize wasp faces in a similar way to how humans see faces. And she decided, "Okay, I think wasps are cool and beautiful. But I still don't like their stingers." (Me either kid.) And she concluded maybe she wouldn't be as afraid all the time now that she'd seen these photos. Monday after school, I brought out the Animal Encyclopedia as our activity before dinner. She's really enjoyed drawing with me lately, so I thought we might try just drawing pictures of the animals that caught our eye as we flipped through the pages. This simple act of just seeing how much Ellie liked the book so I could report in for this review became, no joke, one of my favorite moments ever. She went from saying, "I don't know how to draw a bear!" to just diving in. Then she wanted to write out their full names. It was not only an exercise in increasing her self-esteem around creating but also became another opportunity to practice writing words all while fostering her curiosity about animals and nature. This spring break, I'm going to work with her to begin to create a field journal of all the animals we've seen. It will be full of her drawings of them based on our photos + the photos in this book. And then we'll keep adding as we see more at zoos and out in the world. Such an awesome way to blend learning and fun and creativity for both of us. And this is the part where I admit that I might not have purchased these just seeing the covers on Zulily. They are gorgeous books as you expect any National Geographic book to be, but how they would actually engage my daughter wasn't apparent to me. I mean she's only four. I'm so glad I learned this lesson. Ellie loves them. And we've started doing "quiet time" at night and sometimes during naptime (at almost five she's really getting close to letting go of naps right now). 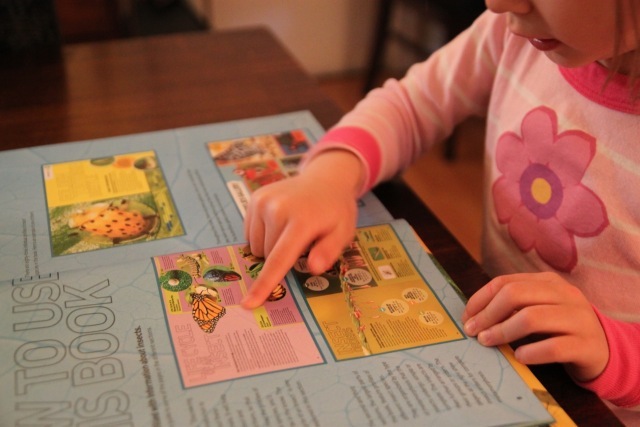 During quiet time, she loves to look at huge books with lots of photos and words, so these are now added into the mix, which of course makes her science teacher daddy very happy. These National Geographic books + other good things are on sale right now over on Zulily. If you're reading this and miss the sale, just click over and then ask Zulily to notify you when they're on sale again. You'll get an email right in your inbox when they're back. Note: This post was sponsored by Zulily in exchange for my honest review of these books. All ideas, photos, and words are mine. And because I'm a huge fan of Zulily's customer service and have bought quite a few things over the years that I'm very happy with, it is a joy to work with them.